Sitting on the deck listening and watching is a wonderful way to eliminate the junk in your head. Peace, quiet and my dogs. And Moon saw it first. Somehow, silently she signaled the boy and suddenly, there was teamwork. Hope the bunnykins escaped in one piece. A great sport, bunny chasing. Topaz has to work alone though and it's great exercise for him. I couldn't believe how many rabbits we saw on our walk this morning. If we don't get some predators soon, some culling may have to take place. Unfortunately with the removal of natural habitat for new homes, the foxes and coyotes have moved elsewhere. My two small dogs often run after the rabbits when they walk the ground. 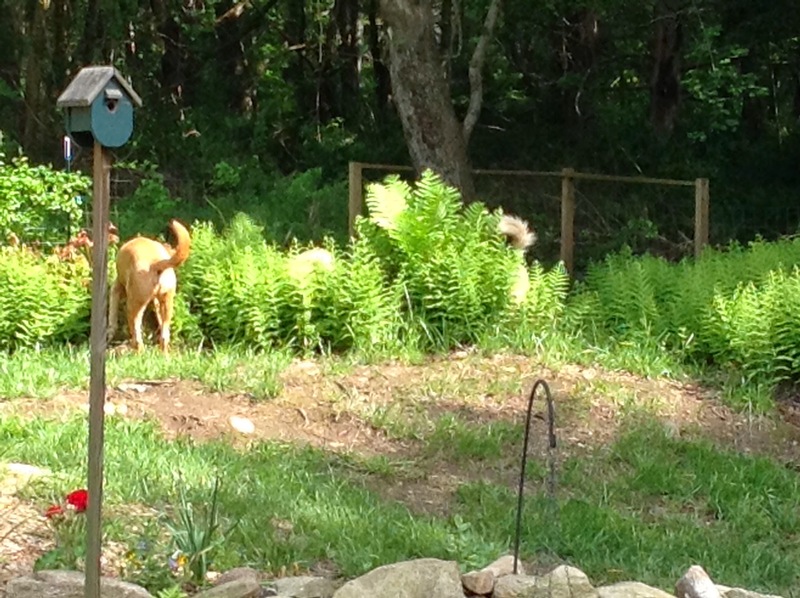 The ferns along your fence are so green and lush JP. Oh, no! Those pesky WABBITS! Shiloh is our bunny hunter. She will alert on them instantly, and set off at warp 9. She caught a young one once, but didn't know what to do with it when it squirmed in her mouth, so it got away eventually. So did they get him? Will it be rabbit for dinner? will you link next thursday, please? i only leave the link open for a day and a half. 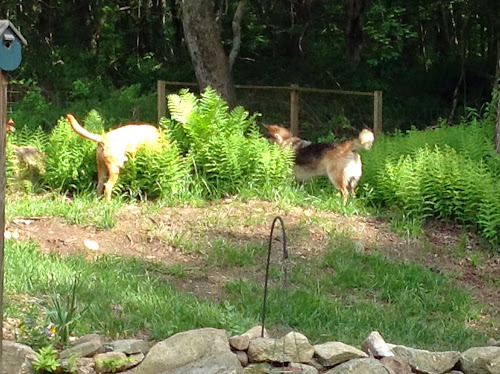 our pups have been having fun chasing bunnies, too. Wonderful photos! The rabbit is cute and I hope it found it's way out. Is Moon part husky? He's beautiful. I love how they are able to communicate and get each other's attention silently... my dogs do that too. The rabbit is so cute! And your dog Moon id adorable.. Great critter post.. Have a happy weekend! So was there rabbit for dinner? :-) I do love that teamwork, though, don't you? We have one that I see running from our deck to our shed all the time. If Duke spots him he'll take chase. JP, stopping back to say thanks for linking up! Happy Sunday!